Sometimes no matter how hard you fight, you can still lose the battle but we refuse to lose the Perthes war. We were starting to feel we had won but Perthes has reared it’s ugly head again. It’s relentless on our Christopher. 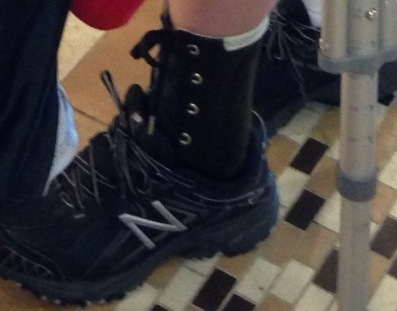 In late July, we received the AFO foot orthotic for his left foot. It made it easier for him to stand and begin physical land therapy. It has been intense and grueling but he has worked very hard and told by the staff that he is the hardest working patient there. In true Christopher form, he continues to smile even though taking one step without crutches is a leaning battle. First we were told it was his foot that was slowing him down. Now we are told it’s the hip. He had the worst physical therapy measurements since this journey began. He’s a minus 3 on his abductors and adductors, which is not good at all. Then, the last two days, he can barely move. Every motion is a struggle and it just breaks our hearts. He says it worse than before the surgery. Dr. Standard told us in his last report, in July, that Christopher could start to run and I promptly wrote him back and said ‘we are still not walking’. It’s the disadvantage of having our good physician so far away. With Christopher’s last PT report, it got his attention and we wants to see Christopher immediately. That’s the part that freaks us out but we know God is in control and has Christopher in His hand. The week of August 19th Christopher will undergo his 8th surgery (not all perthes related) and have his trochanter screws removed and botox injections to improve his range of motion. I’m ready to get off the Perthes roller coaster but we have one more big hill in front of us. We’ll attack it like we always do – with faith, love and looking up to Him. This entry was posted in Hip Surgery #4, Perthes, Pre-Op and tagged 'Ju-Ju' juice, AFO, Baltimore, bone marrow, bone stem cell grafting, Bone Stem graft, bone stem grafts, Botox injections, Core decompression, Dr. Shawn Standard, Dr. Standard, head reduction osteotomy, head splitting osteotomy, hip, hip surgery, HP house, Legg-Calve Perthes Disease, Legg-Calve-Perthes, Meyer's Dysplasia, Orthotic, Perthes, RIAO, Ruben Institute for Orthopedics, Sinai Hospital, surgery. Bookmark the permalink. I just read your latest post tonight. Amazingly, Shanda told me she ran into your mom last night at the nail salon. Christopher, I hope and pray your surgery next week will be successful and get you back on the road to recovery. You are an amazingly strong and courageous young man who will persevere through this procedure. Remember, as Godly Christian Men, we do not have to do all this in our own strength, but just lift our hearts and cares to our Lord and he will help us through anything. I commit to you that me and my family will pray for you by name every day and every night. We will call upon the Lord’s to lay His powerful healing hand on your hip and for you to feel His undeniable presence, unfailing love and endless mercy in an overwhelming way. Christopher, REMEMBER the Lord has GREAT plans for your life. YOU ARE GOD BUILT!!! There is no doubt that HE is and will continue to use all these difficult days to speak into so many people (Family, Friends and All those that meet you). TOGETHER WITH THE HELP OF THE LORD, YOU WILL BEAT THIS AND BETTER DAYS ARE A COMING. I gave Mrs. Shanda a poem the day we met, because at the time she was going through a tough time in her life. I think it’s time to share it with you. It is my desire that it lifts your spirit and gives you renewed hope. all he has promised me. in what I can not see. to bless this life of mine. I didn’t write this poem. but God put it in my path when I was really needing it as well. Now it is in your path. God has not forgotten any of his children, especially YOU Christopher! Your his pride and joy! Your still and will always be my HERO!